A sanctuary of sublime natural beauty in the suburbs of Athens. This tour takes you to the south suburb of Athens called Vouliagmeni, the favourite choice of Greek socialities such as Aristoteles Onasis and Jackie O both for its lake and its beach. Choose this tour if you wish to enjoy a tranquil experience on the beach or in the natural thermal spa just outside Athens. The tour starts at the lobby of your accomodation where you will meet your chauffeur. On your way to the suburb called Vouliagmeni you will enjoy the ride through the Athenian Riviera that has established itself as a world class destination combining beaches, leisure and culture. Driving through old summer resorts of the 50s, 60s and 70s named Palaion Faliro and Glyfada you will arrive 40 minutes later at Vouliagmeni Lake. The lake of Vouliagmeni seems like an oasis just outside the urban scenery. Vouliagmeni Lake is ranked by Greece’s Special Committee for the Protection of Natural Thermal Resources among the 20 recognized thermal springs. Apart from its sublime natural beauty that you can admire with a stroll around the lake, the salts and minerals that are concentrated in the lake create a thermal spa like environment ideal for a relaxing day. You can enjoy the serene scenery, have a cup of coffee or tea by the lake and feel completely tranquil and stress – free. If you are up for a dive you can either visit the thermal waters of the lake or swim in the blue waters of Vouliagmeni beach which is in close proximity. 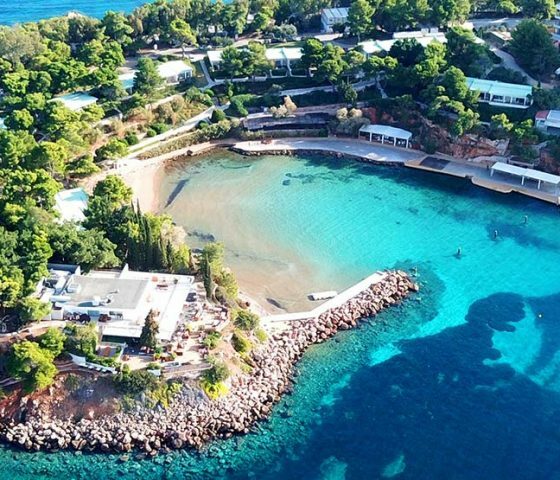 Vouliagmeni beach became a favorite choice of Greek socialites such as Aristoteles Onasis and Jackie O and has been loved ever since. After spending a relaxing day on Vouliagmeni Beach or Vouliagmeni Lake, your driver will wait for you to take you back to your accomodation. This lux and tranquil experience can be ideally combined with the Sounio tour and become a full day of relaxation before visiting the beautiful temple of Poseidon and gazing at the famous Sunset of Greece’s southest mainland site. Once again if you fancy taking a dive in the blue waters of the Aegean Sea, you can choose to do so next to the archeological site during the Sounio tour and right afterwards enjoy a traditional Greek feast by the sea. Vouliagmeni Lake The entrance fee is €9 during the weekdays and €10 during the weekend (there are reduced tariff for children and eldery citizens) and it includes the use of the changing room, shower, toilets, parasols, and chairs (although you might not find any free parasols during the peak season peak hours).